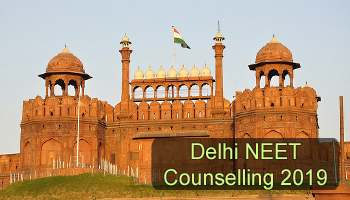 Delhi NEET counselling 2019 Registration will be started from the month of July 2019. The 85% state quota counselling is organized by the MCC. A common counselling will be conducted for admission in MBBS and BDS courses in Delhi universities. Candidates can appear in NEET entrance examination to get admission in the state medical colleges of Delhi. The counselling will be conducted for admission into 85% quota seats of the medical and dental colleges of Delhi. For complete details of Delhi NEET 2019 counselling, candidates can read this article thoroughly. Delhi MBBS/BDS Admission 2019 will be done on the basis of NEET 2019 scores.Check NEET 2019 details. To participate in the NEET 2019 counselling, candidates have to fill the online application form. No separate registration to be done for medical courses in University of Delhi. No individual communication will be sent for the counselling. After declaration of result, the authority publish the merit list, venue and counselling schedule on the website. The counselling will be conducted through online mode. The counselling will be conducted in various rounds as per the availability of seats in the colleges. The seats will be allotted to the candidates on the basis of their ranks/marks secured in the NEET 2019 entrance test. Candidates have to register on the counselling website to participate in the offline counselling. Candidates have to present in the counselling venue on stipulated date and time. There they will be permitted to fill the college preferences. As per the filled choices, candidate’s rank and availability of seats in the participating colleges, the seats will be allotted to the candidates. Candidates can confirm their seat after payment of counselling fee at the time of counselling. It is necessary to report the allotted college in stipulated time period along with the admission letter to get admission. The 15% seats are reserved for SC category, 7.5 for ST category, 27% for OBC category, 3% for PwD candidates and 5% for children/widows of Armed Forces Personnel. Candidates have to produce the relevant document as a proof of reserve category. Candidates should bring the original documents given below along with two sets of self attested photocopy and printout of the application form. If you have other queries about Delhi NEET Counselling 2019, you can write us in the comment box given below. I am from Odisha but my son has done his 11th and 12th from Delhi. Is it sufficient to avail the 85 percent Delhi state quota for MBBS admission or is Delhi domicile certificate required? My daughter has done 11th & 12th from Delhi (CBSE) and I am resident of UP. I want to get her admission in MBBS 2019 in Delhi in 85% state quota. Is she eligible for 85% quota through her 11th & 12 certificates or some domicile certificate required. If required from where it is to be issued. Can i also take advantage of 85% quota of UP. Is there any criteria or procedure through which a candidate of another state can apply for 85% quota of Delhi candidates seats? What documents are required to avail 85% state quota for Delhi for admission in MBBS through NEET. I belong to Bihar and my child has been studying in Delhi since class 4. Will she require a domicile of Delhi? Can she apply for counselling both in Delhi and Bihar? What is the recently date announced for neet examination !! Is it possible 3rd round counciling in Delhi. I have done my 11th from U.P. but 12th from delhi, Am I eligible for Delhi counselling? You are eligible for the state of which you have domicile. Venue of councelling for 2nd round. Date of registration for 2nd round. Delhi neet counselling. Will they conduct counselling for govt. And private both colleges ? Where is the Delhi state merit list NEET 2018?? I have registered for ipu mbbs counseling.Please Tell me what’s next. Can i register for 2 states 85%state quota seat if i have domicile for both states or it is illegal?? Only the candidates those allotted the seat through neet counseling. sir i am from madhya pradesh and has done 11th and 12th from madhya pradesh how can i apply for private colleges in delhi or in other states? my air is 2.5 lakh and sc category rank is 25k should i wait for state counselling or not i m a delhi candidate. I have passed 10th and 12th classes from j&k but I m a permanent resident of new delhi.Do I require a separate domicile certificate of Delhi to participate in state counselling procedure of Delhi or not? I’m from West Bengal. Can I apply for Delhi NEET counseling? As I completed my 10th and 12th studies from Delhi.so can I get Delhi couta for counselling..
What r the dates for the online registration for 85% delhi quota in ggsipu ?? Mere meet me 491 marks he.me SC category’s se hu.kya mujhe DU ka koi college mil jyega. On what date the counselling will start. I have fill in neet application form permanent address Delhi,I have domicile certificate of U.P., can I eligible for counseling of U.P. NEET state quota seats. My son has passed10th,11th,12th form Delhi, he filled in neet application form permanent & correspondence address is Delhi he have domicile certificate of U.P. can he eligible for counseling state quota seats of Uttar Pradesh. If I have studied 10,11 and 12th from Delhi,still I require to have Domicile certificate of Delhi?